To those of you who celebrate it, Merry Christmas!!! And to those who celebrate other things this time of your no matter what it is, Happy Holidays to you as well. Another one is in the books and in some places a lot of the white stuff has hit, just as it has all over the grid. In my last transmission I featured a new mesh head with the Bento technology that has been released within the last month. A lot of creators who have already made mesh noggins have started to ship out their updates with new versions of their product as well as versions with Bento. In this particular shoot, I am using the updated Adam head by Absolut-Creation (Ginger Chevalier). While there are no animation packs available at this time, the ability to change your look via the sliders in your shape adjustment section of your viewer is there. Now you can keep the look the designer has intended or you can venture on your own to make an even more unique look for yourself. [Deadwool] is in the Christmas spirit and has placed out for their Group Members a nice little gift of the Erik gloves which come in several mesh body fits (Signature, Slink, TMP and Standard) and also in three different tones (Black, Blue, and Gray) and two pose types (Relaxed and Closed). These are great for your outdoors looks and photos. Thank you to Masa Plympton for sharing those with us. It’s been a while since I’ve featured anything from the FaMESHed event but Kauna released a nice holiday themed jacket/sweater combination called UPCLR, which comes in two colors (Brown and Gray) with several different options including a string of Christmas lights that hang around your shoulders. Also included are a pair of trousers in the same two color options as the jacket. The sweater itself has two different festive designs in several colors as well as plain for those who are not feeling so cheery. For the feet I’ve paired the outfit with the BOSTON boots from Antoni & Daniel, formerly the people of ODDITY3D. These great boots that have a fit for SLink, Signature, TMP, and Unrigged have many single pack color options but if you pick up the Fatpack, you get three exclusive colors for free that you would not be able to get by just buying them standalone. The value in that by itself is a plus. I have two different products from MODULUS this go round. 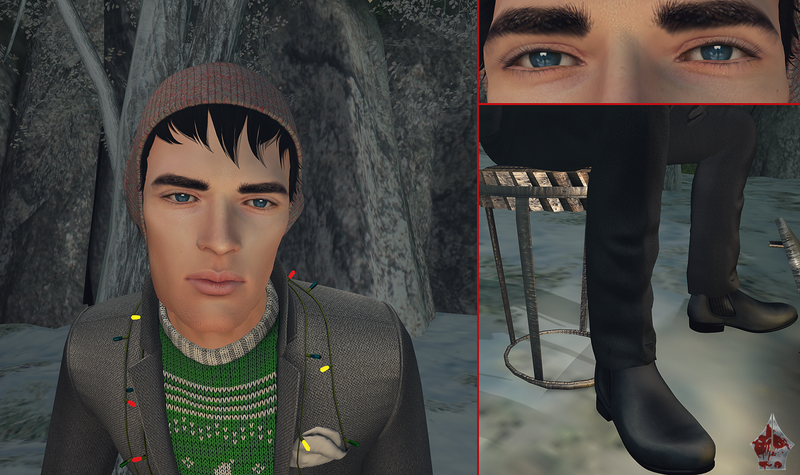 A hair/hat combo called, Riley, which is a little similar to the item released in the SwagBag for December save for the color/texture of the beanie which are specific to each one. You can purchase Riley at this month’s TMD. 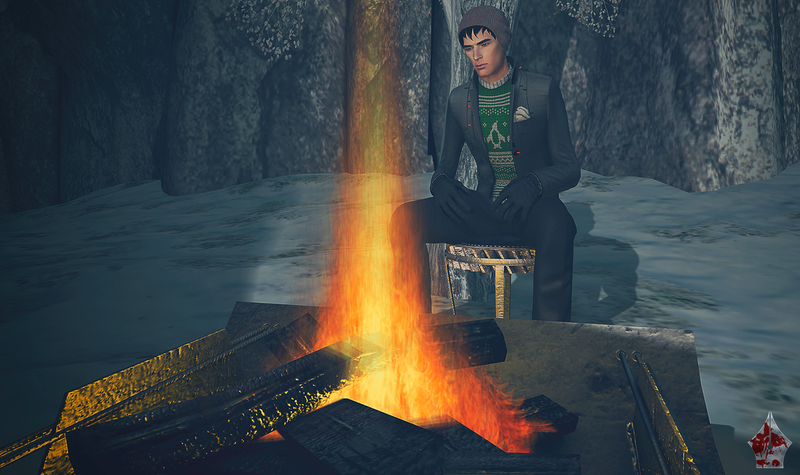 There is also a Firepit and Stool set that you can grab at the December round of Shiny Shabby. The Firepit has different options for intensity of the flame as well as a smoke option. The stool has single pose animations for both Male and Female. It’s a nice addition to your winter decor outside and can easily keep your pixels warm while you spend time getting fresh air. There are taxi’s waiting below for you to check out these great events and stores. Enjoy the rest of your holiday and I’ll be back again soon with something new and exciting. Until then, keep it stylish fellas! P.S. This posting was in the 98% finality stage when learning of the untimely passing of George Michael who wrote and co-performed the inspiration used in this photo. Instead of scrapping it and using something different I am going to post it in honor of him and this timeless Christmas classic. May you rest well in eternity and thank you for your contribution to the music industry.